Vote for what can benefit you the most. Just because Dark Kali is a dream sub for some people, does not mean you should be voting for her if it cannot benefit you. Think about what is being released in the next month and how that may influence your team line up. For instance, Xiang Mei should go live soon and if you plan on using her, voting for Gadius and Uriel would be wise. Sometimes, the bottom voted gods are only separated by a thin margin of votes and holding off on voting until the final day can help swing the tide in your favour. Granted this is a small sample size, but the rates of the coveted 6 star GFE are distressingly low. You can read more about the previous PCGF in my other post HERE. Keeping those points in mind, it is up to you to determine where to spend your hard earned stones. If you are missing numerous featured gods in the PCGF, this may be your time to shine and acquire numerous gods to round out your roster. Player’s Choice Godfests are ideal for the vast majority of the PAD population and is an exciting time of the year and hopefully the 25 voted gods are powerful and relevant so please be careful when voting. I will also have an in-depth post covering the 25 featured gods once the results have been released. That post will have the same insight and information contained in my regular godfest analysis and will help you determine how to better use your new pulls. Also, correct me if I’m wrong but UNLIKE godfests GFEs don’t get 3x or 4x rates. Hence ironically the greater probability of rolling a 6 star during a regular gf…? Not sure where this misinformation is coming from, but the GFEs that are voted in get the same rate as the other voted gods (3x or 4x). GFEs that are not voted in cannot be rolled in pcgf. I an at a loss for which to go for. I am rank 417 an have a box developed enough to where I am started to chase after the 6 stars and also have the IAP to do so but I am also missing 2-4 key subs from each color from the REM(Not enough IAP to go for both). I have about 80% of all the gods/GFE and I know this will be hard to answer until the PC list is finalized but would it be worth rolling and risking many dupes or rather wait. I already have dupes of most cards so inheritance plays no factor one this decision? I don’t have a PadHerder but I main YomiDra and NeptuneDra and I’m trying to find a way into the next meta mainly Sherias Roots is what I would want from the next 4x GFE. Hard to say until the list is finalized. Are you mostly missing cards from regular pantheons and how many 6* gfe are you still chasing? 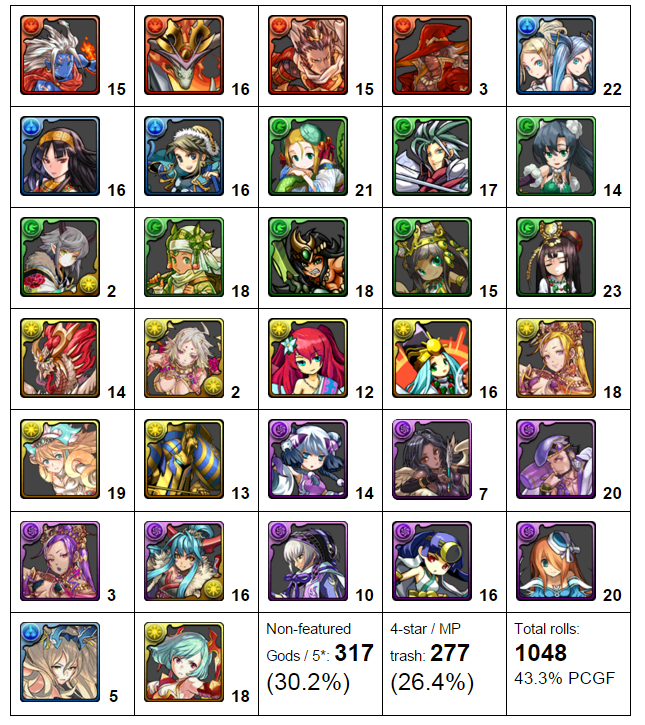 If everything is featured you want (6* and pantheons) some rolls may be fine in pcgf as there Is a lot of overlap. Are you missing any staple subs from yomi and Neptune dragon? I am missing both Akechi and Okinushi for YomiDra and just Blonia for NepDra but I have Mori so I don’t think that Blonia is really a vital as what I am missing YomiDra. The 6*s I would go for would be Escmali(not as much Becasue YomiDra is falling out of the meta but to make arena 1 easier), Dkali for either RaDragon or Sherias Roots which is also gonna be a 6*. Clear I have checked to votes and it is safe to say everything I mentioned will be in the voted in. I am missing about 0-2 from each pantheon and also 0-3 from each GFE series so it is spread out evenly. Hmm that’s a tough call then. Pcgf will most likely be 3x rates. Some rolls in pcgf may be beneficial considering you have a need for many cards (akechi and oku are big needs for yomi dragon). The argument of gaining benefit now compared to later (whenever a 4x gfe returns) can be applied. If you wait for a few months, you may miss out on content/rewards now. Dang, I have never not rolled all my stones. I am a all or nothing kind of person, but that seems like a good way to approach this. Thanks for the time!!! Mantastic, is there a chance that you could look at my box and offer a suggestion on where I should be putting my time and effort? Other than my Shiva team I am having a problem getting an idea of where to aim. I’m typically a non-IAP, but I’m gonna drop some cash on one of these and would love some input. However I will understand if you would prefer not to open the can of worms that is offering box advice in your comments section. thanks for the advice, precisely the type of advice I was looking for. Shiva has pulled me through man dungeons, so I will remain faithful… for now. Just pray pcgf is nice to you! Awoken shiva is a strong fire lead and you have some tpa subs and numerous orb changers such as set, chiyome, Yamato.